Warning sounds began to ring in my head as Billy shared about how he grew his sales to $5 million a year in only four years without any debt. Later, I discovered Billy grew his sales rapidly by pricing his products below his costs! Actually, Billy’s records were so poor he didn’t know his costs until my analysis was complete. Billy didn’t understand finances well enough to know what a fair and profitable price for his products might be. To grow your sales God’s way, you need to know your costs and price your products fairly, both for the customer and for you. 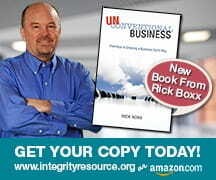 Reading my book “Unconventional Business” might be helpful.